Background: Early this year curator Jo Lauria was invited to select the works for my retrospective exhibition coming to Cranbrook Museum in the summer of 2016 (see NEWS). 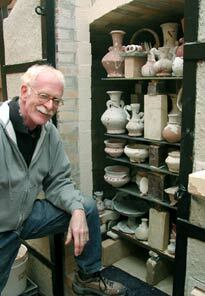 For over 50 years I had reserved what Susie, my wife, dubbed: “The Prime of Their Time” pots and from this collection Jo Lauria selected 250 pots and sculptural pieces for the Cranbrook exhibition. From the some 600 remaining pots I am now releasing many to my online SALES GALLERY, the studio showroom and abundantly to this upcoming Open House. Followers of my work will see many “Prime of Their Time” pots! 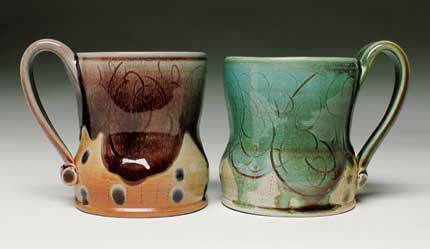 Plum Tree Pottery resident from 2012-2014, Julia Walther will also take part with a selection of her recent works. (mugs shown here). This exhibition was curated by my colleague, Paul Young, who heads the clay department at the Birmingham Bloomfield Art Center. Paul was my studio assistant from 1989-1991, so it was a real pleasure to collaborate on this event. The exhibition surveyed the span of 42 years of my work and it included numerous examples of present day work as well as their antecedents. 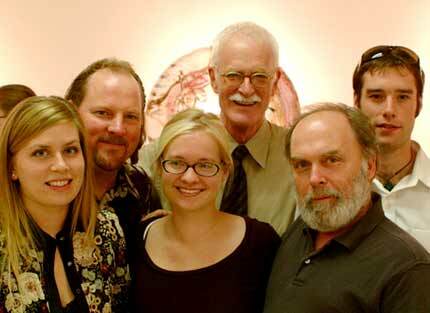 Current, future and former assistants at the opening of John's exhibition. "FRESH PLUMS" (the PTP blog). "A very, very large blog for the pottery field." It is large, and the reasons have to do with its origins and subject matter. 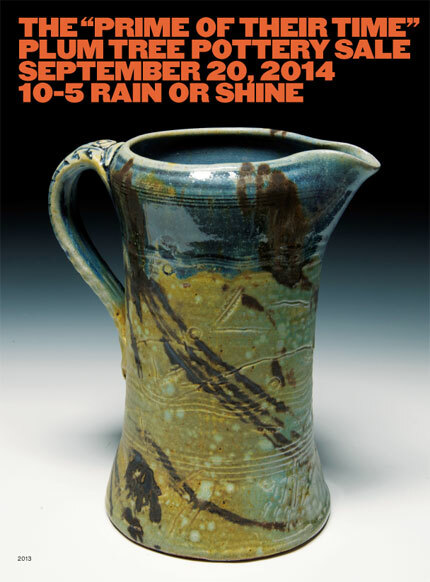 In 2005 I juried the Strictly Functional Pottery National show. I was disappointed to discover that many of the 1300 submitted slides were poorly lit, rendering them useless to me in judging the work. 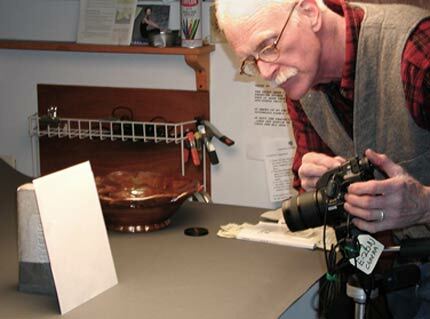 As my juror's responses were returned to the artists, I included a letter suggesting fundamental ways potters could learn essential photography skills. A number of potters subsequently conveyed their appreciation of my comments. This photography blog concept is a direct outgrowth of this experience. And looking back, I vividly recall my own bumpy path to more successful photography, and I'm grateful for all the advice, critiques, books, articles, and seminars that I've sought out to improve my skills. It's an ongoing process. And, it is a survival skill! So, I've pulled together resource materials, hard-won personal experiences, the current advice of photographers and potter colleagues, and my own "do it yourself" approach to all technological challenges. Simply put, I feel more empowered as an artist when I'm in charge of how images of my work are produced and conveyed. My goal is to enable potters to master the early learning curves associated with acquiring good photographic skills. Outfitting oneself with serviceable tools (e.g. camera, lighting, software) to make excellent photographs is essential and achievable in our ceramics field, where digital images are already the de facto medium for professional communications. "Now that the photography blog has begun, I am more interested than ever to work on the ideas listed below. Watch for Fresh Plums to emerge!" Share perspectives about and images of the large collection of 42 years of my own work, and highlight pivotal periods in my development. Survey work of past studio assistants at Plum Tree Pottery who've pursued careers in clay. Show pieces fresh out of the kiln that excite that little kid in me so much I want to bring them for "show and tell!" 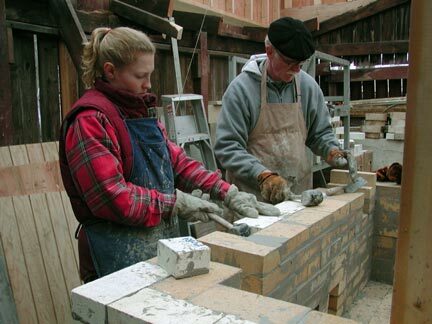 Provide a sequential photo survey of the recent building of our salt kiln. 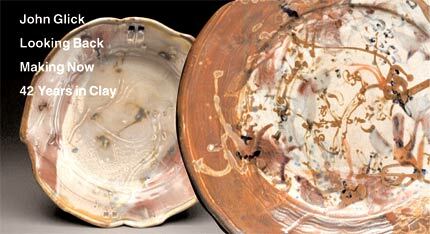 Document differences between salt/soda fired ware vs. reduction fired work. Read reflections of assistants at Plum Tree Pottery about the experience of being here for a year. Give guidelines for collectors about dating my pieces, by using identifying marks and stylistic aspects involved with past phases of production. The NEW "BABY" is not so new any more. She "walks and talks" and we continue to love her more with each firing. And, unlike human babies which fortunately do grow, this one still weighs just 28,499lbs, 6oz! Built during the summer of 2004 with much truly invaluable help from my assistants Melissa Vaughn (PTP 2004) and Kirke Martin (PTP 1999), using the kiln has become our special "treat" to ourselves owing to the delightful surprises it offers us. When you visit our showroom, watch for the pots with the yellow dots on them, which indicate their origins in the new kiln. The 55 cubic foot load capacity kiln replaces a smaller salt kiln built in 1973 with the assistant of that year, designer and colleague Rosti Eismont. Rosti and his wife Jeani are also the designers of our website. 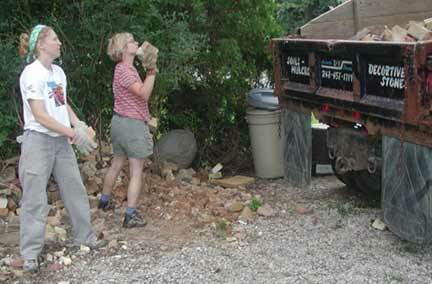 Melissa and Laura say "goodbye" to the last of the brick rubble from the old kiln and "honest", when I finished photographing this rather symbolic ritual, I threw in my share of bricks as well!! Really! Our new salt/soda fire kiln offers added surface enrichment possibilities for my pots and sculptural pieces and adds another layer of adventure to my thinking owing to the oft-times unpredictable nature of this type of firing process. Susie, my wife, quipped at the time, this kiln building project epitomizes the concept of what optimism is all about - a sixty-six year old potter who builds a kiln that will last 30 years! Absolutely! !